Maryam Maquillage: NAKED 3 Tutorial: "Rosy Smokey"
Prime the lid with Urban Decay primer potion in Sin (champagne). Using the flat side of the included brush, apply Buzz (rose) over the outer lid and Trick (gold) over the inner lid, patting on the color. Using the tip of the fluffy brush, apply Nooner (matte plum) to the crease and blend out with Limit (matte beige / pink). Apply Darkside (satin gray plum) to the outer v and lower lash line using a stiff pointed crease brush. 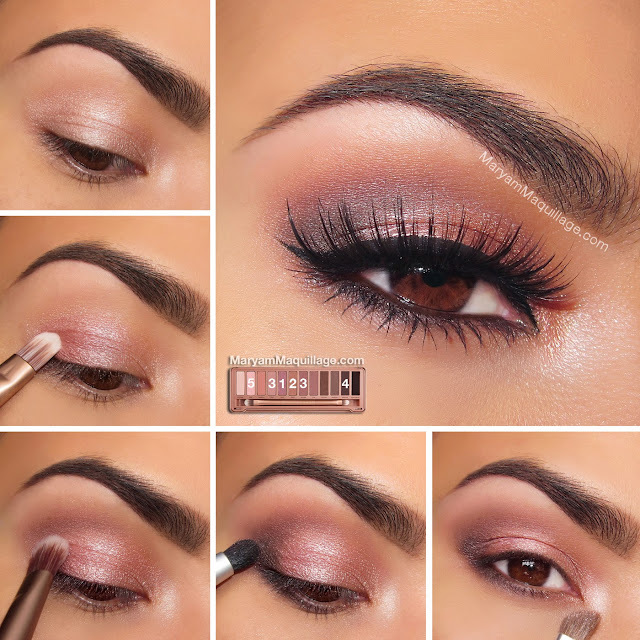 Apply Dust (shimmery pale pink) to the inner corner. Line the top lash line with a black liquid liner and extend the wing. Rim the waterline with a waterproof liner of your choice (I chose brown to match my eye color). Apply lashes and mascara. Don't FORGET!! 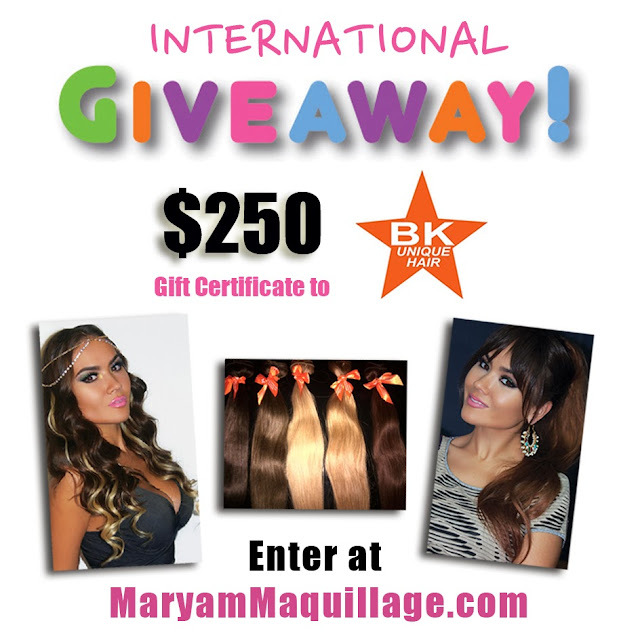 My first "Month of Giving-Aways" International Giveaway is still going strong!!! Check out youtube for Ud dupes! Why spend $50 on it when you can get drugstore dup that is exactly the same? Actually if you added up 12 diff. colors of cover-girl... it'd be roughly $60. This comes with a professional brush & a sample packet. It will last me almost all year, and only cost me $52. Cute eye makeup...if only my brows were looking like that...mine look so crazy lol...gotta pluck when I get home. This is so stunning & those lashes are to DIE for!! I so don't need this palette, but i want!! NAKED eye art is indeed fascinating & stunning ! Gorgeous! These shades are perfect for you! Gorgeous. I'm not interested in the palette but now I want to buy it! Beautiful! Can you please tell us what you used on your eyebrows? Thanks!